If you charge late fees, the system can calculate and post them for you. You designate the number of days past the invoice date for a transaction to be considered late and you designate the percentage of late invoices to post. Note: In the calculation of late fees, unpaid late fees will be included in the past-due amount and will accrue late fees as well. Step One: Notify Execu/Tech that you wish to post late fees. We will install this program add it to your Direct Bill menu or give you instructions. You may email your request. Step Two: Set up the Transaction Code. Set up the transaction code as shown below. Leave the "unit" field blank. Leave the "fixed amount" blank (zeroes). If you are using Execu/Tech's Back Office G/L, enter the G/L codes as appropriate. For complete instructions on transaction codes see Control Files Setup . Step Three: Edit the Parameter Record. 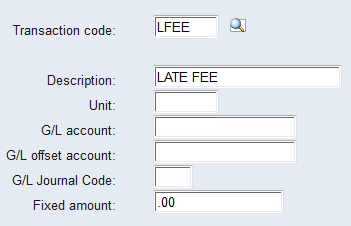 "Late fee charge code:" Enter the transaction code that you set up in Step Two. "Late fee days:" Enter the number of day after the invoice date to consider an invoice late. 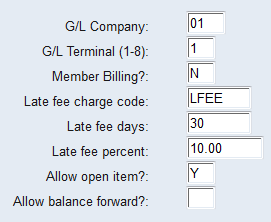 "Late fee percent:" Enter the percent to calculate on late unpaid or partially paid invoices. The example above is ten percent. Nine 1/4 percent is in the format 9.25 and so on. "Allow open item? : Answer Y. For complete instructions see Control Files Setup . Step Four: Edit the Customer Master Record. 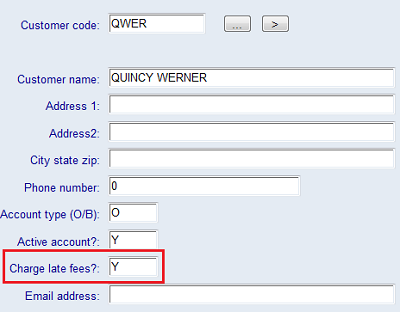 For each customer to whose account late fees should be charged, answer Y in the field "Charge late fees?" as shown above. For complete customer setup instructions see Customer Setup . Step Five: Run "Post Late Fees" from your Direct Bill menu. 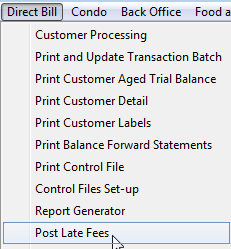 From you Direct Bill menu select "Post Late Fees". At the prompt, enter the "as of" date. This is the date on which the fees will post. It is also used to determine whether an invoice is past due or "late". You may enter a beginning and ending customer code (use the same code if posting to only one customer). If posting to all customers whose accounts should receive late fees, leave the customer field blank and press Enter through the fields. You will receive a notification message when the posting is complete. Click OK. Step Six: Update your batch. Remember to update your transaction batch.